Thank you to all the companies, organisations and individuals that helped to support Bird Atlas 2007-11 through the Species Sponsorship Scheme. Sponsored by Judith Manners for her Mother and everyone who loves the wildness and excitement of the Snow Goose. Staffordshire branch of the West Midlands Bird Club. Harry Green in memory of Arnold Darlington, biology teacher “who long ago inspired my interest in birds and natural history. Northumbrian Water; a leading environmental business and proud partner of the Northern Kites project. Harris, Elsie, David & Peter Glue, New Forest, Hampshire - the species that has bonded this BTO family over the years. Hazel Douglas for My Birds! Jen Woodland and her three grandsons Robbie, Iain & Alistair Adams. In memory of John and many happy hours birdwatching. 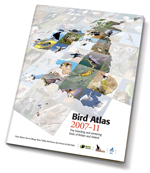 If you have any queries about the Bird Atlas Species Sponsorship Scheme please contact the BTO fundraising team at fundraising [at] bto.org or Niall Hatch at nhatch [at] birdwatchireland.ie (subject: Bird%20Atlas%20Species%20Sponsorship) .